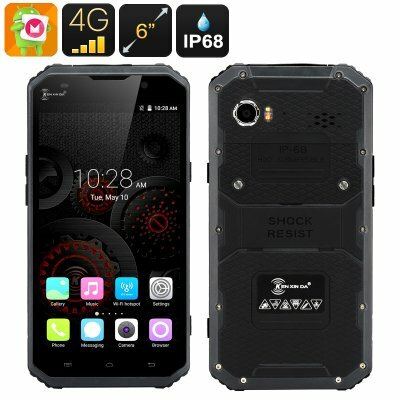 Successfully Added HK Warehouse KEN XIN DA PROOFINGS W9 Rugged Smartphone - Android 6.0, 4G, 6 Inch FHD Screen, IP68, Dual SIM, 2GB RAM (Gray) to your Shopping Cart. This latest KEN XIN DA model comes with a 6 inch full HD screen, Android 6.0 and 4G support on two SIM cards. What's more, the smartphone is waterproof with IP68 rating and will be able to accompany you on tough adventures in the great outdoors. Get your hands on a nice 6 inch smartphone boasting full HD resolution. With it, you will have a great platform for your media watching, gameplay, web browsing and more. With Android 6.0, you also get a friendly intuitive interface at your fingertips and access to the Play Store for more fun! The smartphone supports two SIM cards and supports a wide range of networks: 2G(GSM 850/900/1800/1900/2100MHz), 3G (WCDMA 850/900/1900/2100MHz) and 4G (FDD 800/1800/2600MHz, B1/B3/B7/B20). With a 4000mAh battery, you have up to 6 hours of non-stop talking time and 120 hours on standby. You will have 16GB of internal memory + 32GB externally to load up on apps and media files and Bluetooth 4.0 ensures efficient data exchange with other devices with Bluetooth support. Despite lots of media features and a full HD screen, KEN XIN DA PROOFINGS W9 is a rugged smartphone and is meant to be a great outdoor companion. With IP68 rating, the smartphone is dustproof, shockproof and can even be submerged in water.